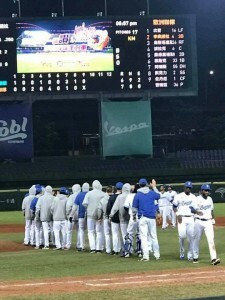 Team Europe showed a much improved performance at the Asia Baseball Winter League in Taiwan compared to their first appearance last year. Competing against selections from the professional leagues in Japan, South Korea and Taiwan, the team managed by Andrea D’Auria and former Major Leaguer Desi Relaford captured four wins in 17 games overall. Federico Celli (Italy) had Europe’s best batting average with .362. Jesus Ustariz (Spain) was Europe’s best batter, going .357/.500/.464 with a home run, three doubles, 10 runs scored and 11 RBI in 17 games. Dudley Leonora (Netherlands) led the team with two home runs, Celli with 15 runs scored and Leomartis Rodriguez (Spain) with 16 RBI. On the mound Eduard Pirvu (Romania) and New York Yankees minor leaguer Artur Strzalka (Poland) had the best ERA on the team with 1.50 in 12 innings each. Marc-Andre Habeck (France) and Strzalka led the team with 13 respective 12 strikeouts. Pirvu, Habeck, Nicolo Clemente (Italy) and Alessandro Ciarla (Italy) picked up one win each. Owen Ozanich (France) pitched the most innings with 14 1/3.